So did Ashoka's missionaries reach the Celts and establish Buddhism as far west as Britain? 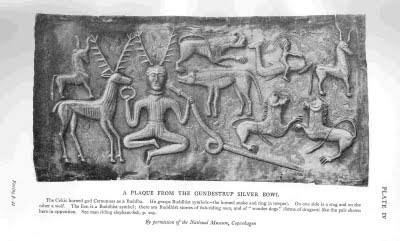 Is the meditating figure on the Celtic Gundestrup Bowl the Buddha of the West, Virupaksha? So perhaps the Druids were influenced by or adopted the Buddhist teachings they encountered. The Druids were pan-Celtic and travelled unhindered from one end of the Celtic world to the other, ie from Galatia in the east, westward through Balkans, Austria, Helvetia, Gaul, Galicia, Britain and Ireland. The main Druidic college was in Britain on the Isle of Anglesey. It drew teachers and students from Ireland, Britain and Continental Europe. Origen attributed the rapid and unobstructed growth of Christianity in Britain to the foundations laid by the teachings of the Druids and Buddhists. The Gundestrup bowl, a beautiful piece of pre-Christian Celtic craftsmanship, seems to show a meditating Buddha. Triskeles - classic Buddhist symbols - also appear in pre-Christian Celtic designs. Celtic mystical art often displays elaborate knotwork designs, which symbolize the interconnectness of all phenomena. Similarly Buddhist philosophy is concerned primarily with interconnectness. In fact, it is the relationships, the interdependencies that are the reality, since objects or subjects are nothing but their connections to other objects and subjects. 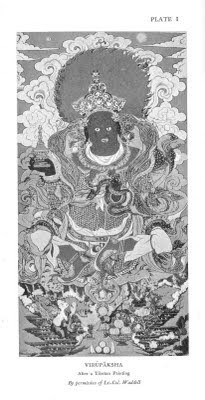 The Celtic theologians Pelagius and Johannes Scotus Erigena demonstrate an understanding of human nature that has more in common with the Buddhist view of innate Buddha-mind clouded by delusions and misdirected will, than with the Christian doctrine of corruption of the soul by Original Sin. Pelagius may have been influenced by the Druids or a Druid himself. The Buddhist teaching on Dependent Relationship states that phenomena exist in three fundamental ways. Firstly, phenomena exist by dependence upon causes and conditions. Secondly, phenomena depend upon the relationship of the whole to its parts and attributes. Thirdly, and most profoundly, phenomena depend upon mental imputation, attribution, or designation. According to John Michael Greer, Druid philosophy has a similar division into three 'elements' which are known in old Welsh as Gwyar (change, causality), Calas (structure) and Nwyfre (consciousness). Another great blog! I also wanted to point out the possible connection between the Hindu Vedas and Northern European belief systems. Another interesting point to consider is the presence of the "red-haired" mummies discovered in China. They are so well preserved and are clearly wearing something akin to a tartan. "Recent excavations in the Tarim Basin in Xinjiang province have uncovered more than 100 naturally mummified corpses of people who lived there between 4,000 and 2,400 years ago, indicating that the Aryan race of red and blonde hair with blue eyes lived in this area at one time. The bodies were amazingly well preserved by the arid climate, and according to the New York Times "...archaeologists could hardly believe what they saw."